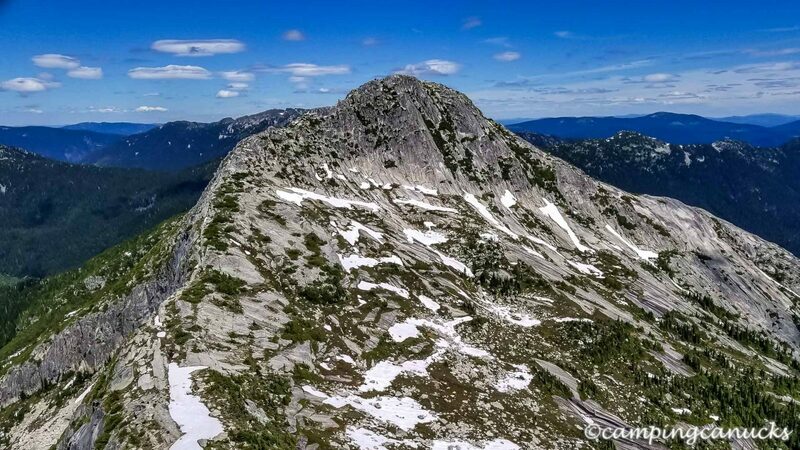 We quite often find ourselves coming back to the Coquihalla Summit Recreation Area year after year as there always seem to be new locations to explore and new sights to see in all seasons; and its relative accessibility makes it a great area for day trips whether you’re skiing or hiking. But as we have hit most of the easy-to-reach locations, we have started to move more into the remote spots. 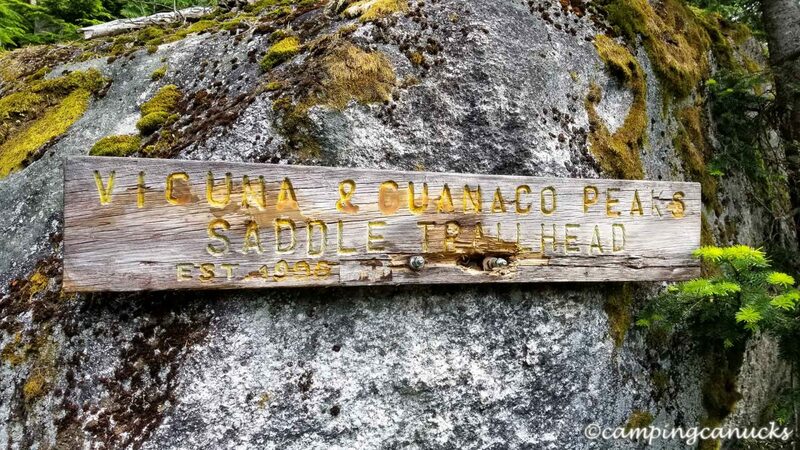 Guanaco Peak is one such spot that we decided to go for in July 2017. It’s not that it’s all that far from the highway but more that the road in is quite rough and very overgrown. That means a long walk in (extra five km each way) or just plunging down the road in your vehicle. As an alternative, you could drive to the Little Douglas Lake site, park, and bike in. Our plan on this trip was to drive as far as we could down the road, find a place to park, and walk to the trail from there. We hoped that would only add a couple of extra kilometers each way to our hike. However, the moment we stepped out of the truck, we were swarmed by legions of mosquitoes. So many, that after walking about 200 meters down the road, I decided I would just plunge my truck through the brush as far as we could go. This was certainly an option but for those who do so, be prepared to have to buff out a lot of scrapes and scratches from the copious amounts of brush sliding against the side of the vehicle. 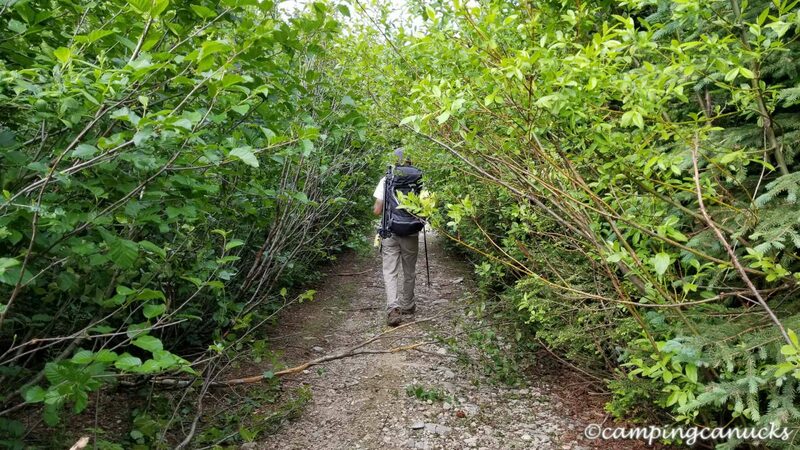 In any case, you will still end up about a kilometer from the trailhead as there is a barrier at a creek that we found was impassible in a vehicle. Nonetheless, after parking about a kilometer from the trail it wasn’t long before we found ourselves at the trailhead where the steep climb up begins. 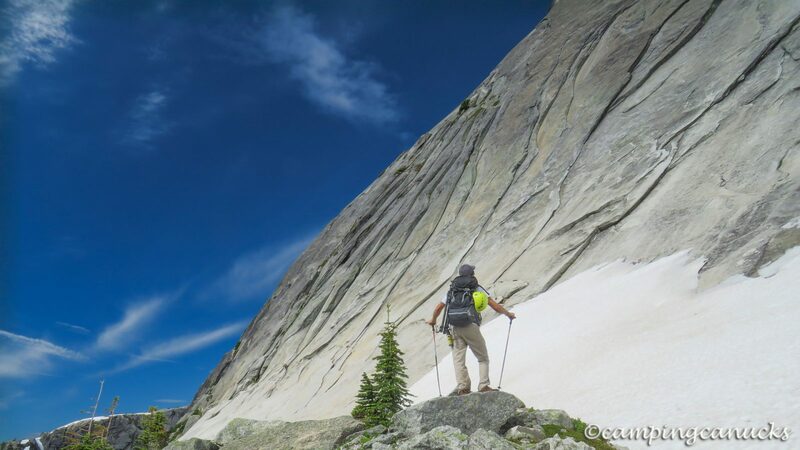 Once on the trail, it’s just a straight shot to the alpine. I guess the trail builders didn’t feel switchbacks were needed so the trail is pretty well straight up. That said, it was less than two kilometers before we found ourselves getting above the treeline and traversing north towards the saddle between the peaks. 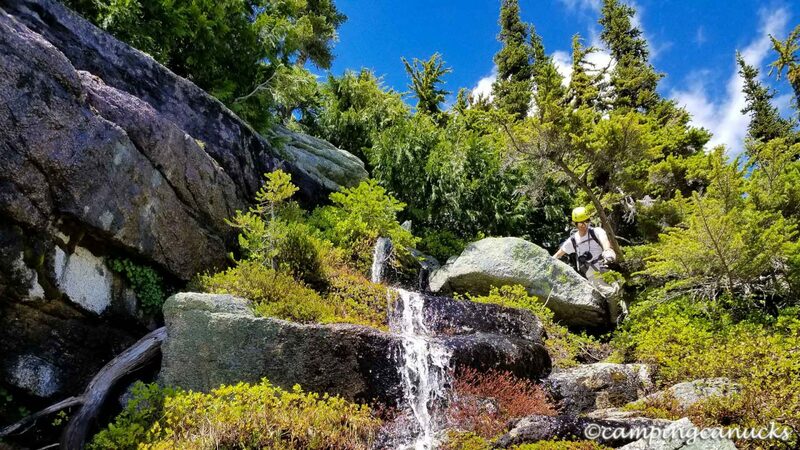 We did this trip in mid-July and still found there was a lot of standing water and mud on the trail as well as quite a bit of snow still remaining. Without waterproof boots, you will have wet feet. Overall, though, the trail was in good condition with very little deadfall in the trees. The trail leads up to the eastern base of Vicuna before working its way north towards Guanaco. 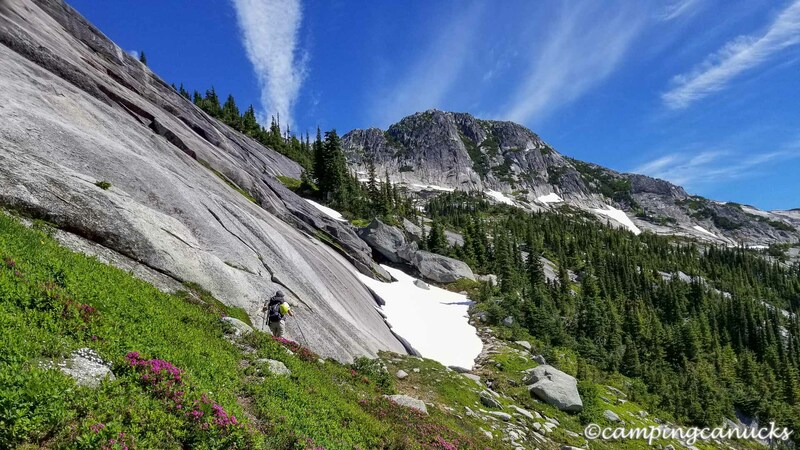 At this time of year, we still found large sections of the trail were under the snow but it was still fairly easy to work our way to the saddle. Even at this point, there were some fine stops for a break with nice views to the east. And on this day, we could quite clearly see lots of smoke billowing up from a wildfire near Princeton. I couldn’t help but to think about the climbing potential of this area for those who are willing to pack up their climbing gear. Once on the saddle, there were two very clear trails leading to Vicuna and Guanaco Peaks. For this trip, we followed the north trail as our plan was to reach the top of Guanaco. As we worked our way up, there were sections that required scrambling now and again but nothing that was too difficult. It’s really a matter of following the cairns and looking for signs of previous passage. A rope certainly is not required although we did wear helmets in case of a fall or rocks but they weren’t absolutely necessary. In the end, we found we went up a slightly different way than we came down as there are a number of different routes to and from the summit. 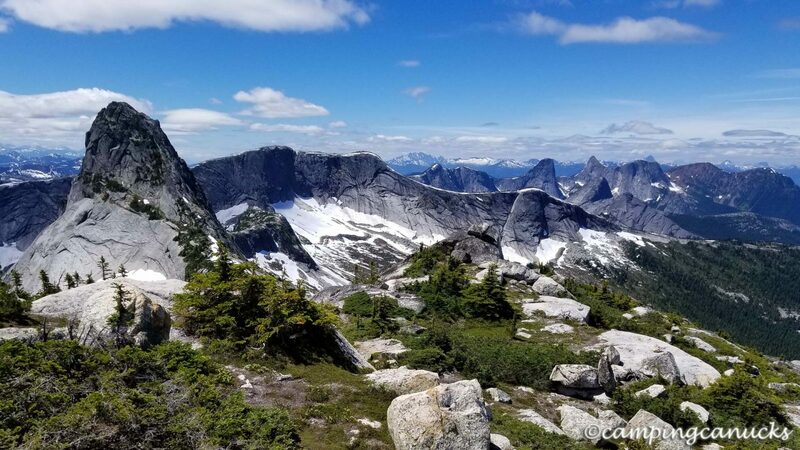 Considering this was mid-July and much of BC was socked in with smoke due to the many wildfires, we found on this day that we had clear and unobstructed views in every direction. 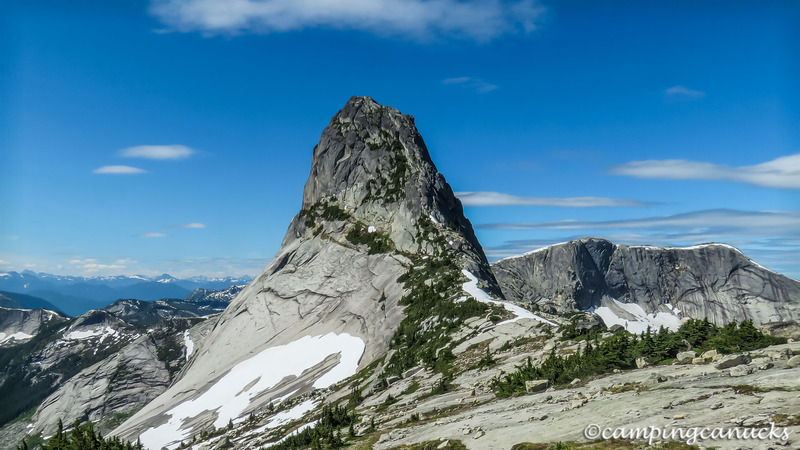 For that we were grateful, as we could clearly see the many peaks in the Coquihalla area. 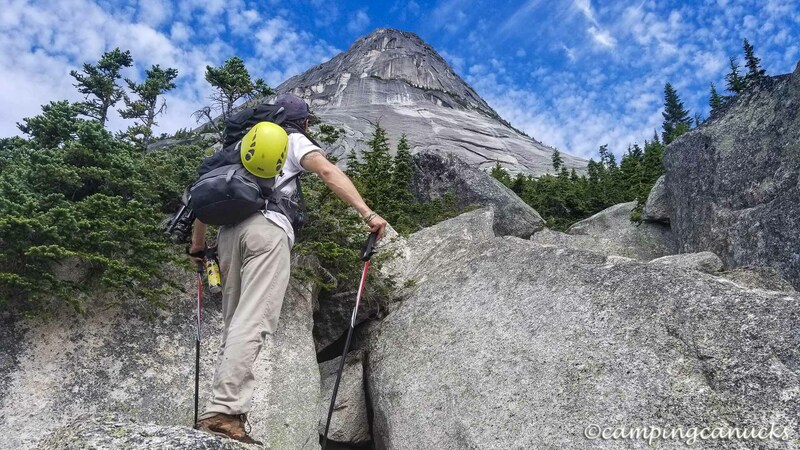 It reminded me of Yosemite Park in California with its many granite peaks and slabs. Perhaps someday I’ll pack in climbing gear for some further exploration of the area. Once on top of Guanaco, we took a long break enjoying this wonderful summer day. Having brought along a camp stove, we made coffee and soup, and shot a lot of photos. Dave went wild with the camera and the tripod and spent hours running around framing the perfect shots. The summit would also make a great place to camp for a night, provided the weather was good, although there was no water supply so you would have to pack it up. Going down was easier than coming up as we could more easily see the tracks from previous hikers and it didn’t take us long to get back down to the saddle. We ventured over towards Vicuna and I made a bit of an attempt to get to the top. Having read that there is a chain to assist in one steep spot, I went up the chain pitch before calling it a day. From above the chain, there would have been some interesting down climbing and I wasn’t feeling up to that on my own. Once finished with the peaks, we quickly and easily made our way back down to where we parked. For the whole day, the only wildlife we saw was one pika chirping at us from the rocks. We would highly recommend a hike to the top of Guanaco for those looking for a relatively short hike that rewards with outstanding views. We do plan to come back to this trail again in the future for further exploration and perhaps even a night spent on top. 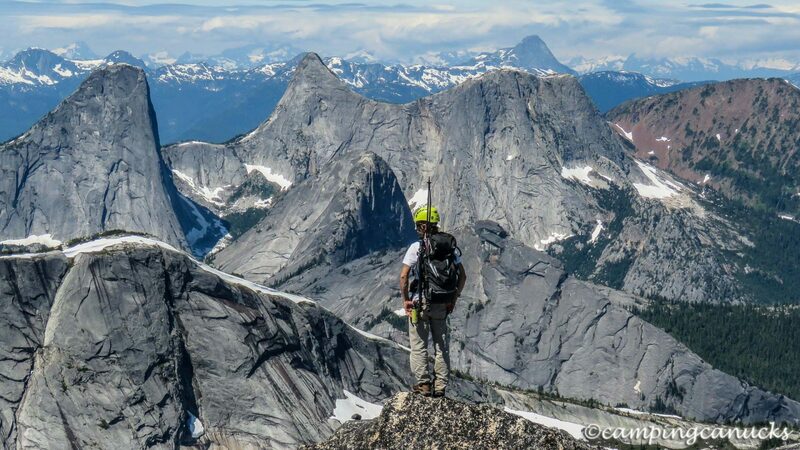 This is definitely an area that seems to have a lot of potential for exploration although access to some of the peaks looks to be a bit daunting and could be an adventure all on its own. Great photos Jeremy. This brings back memories for me. Thanks Doug! I find it hard to believe that I didn’t get up there sooner. It’s a great place!